A few months back I spelled out a short list of the gear we would be trying to acquire or make for the upcoming season(s). One of our primary goals was a twin separating quilt, one with a lower temp rating than my solo quilt (which rates to about 30 deg). I wanted Loonie to be snug as a bug and a twin has the benefit of shared body heat. Generally, I sleep warm and combining that with a lower rating of, say, 20 deg, Loonie should be good to go, through shoulder season anyway. The ability to separate the quilt for solo use wasn’t so much a priority as it’s unlikely she would be going out without me. So, unbeknownst to Loonie, I had been tucking a few bucks away here and there in the hopes of surprising her with an uber-light custom-made “Bulldog” wonder quilt. Then I start crunching the numbers ($) and it became clear that I would easily break the $400 mark if I were to go with the absolute lightest materials I could get my hands on. The 950 fp down alone was going to be approx $340! When all was said and done I might save $100 – $150 vs going with a custom-made quilt from one of the various cottage industry suppliers. I started poking around at what those guys were doing to see where I might be able to cut some costs. That’s when I stumbled upon what might be the best value in the backpacking universe: Enlightened Equipment’s Accomplice! Finished wt. with 20D shell: 35.71 oz! I couldn’t believe it! I had a target finished weight of 30 oz or less. The weight penalty of the 800 fp down was only 6 oz. or so and the quilt guru Tim Marshall and the fine folks at Enlightened Equipment would make it for me. AND the pad straps are included, another item on our list. Of course, they could also supply the quilt with 850, 900 or 950 fill but the price goes up SIGNIFICANTLY for a minor savings in weight. It was a no-brainer. We ordered the quilt. At a finished wt of 36 oz, it’s WAY lighter than two typical 20 deg bags and less expensive. We went with the 20D shell for a bit more durability at a penalty of 3 oz. 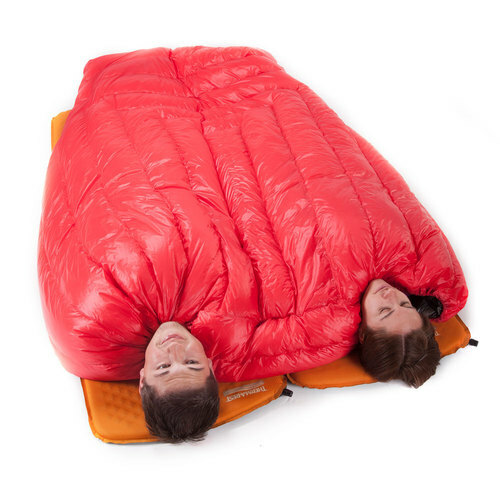 So, as you can see, if you went with the lighter 10D shell you could have a 2 – person 20 deg quilt that weighs just a speck over 2 lbs manufactured by one of the most respected companies in the backpacking community for $375. Absolutely incredible! 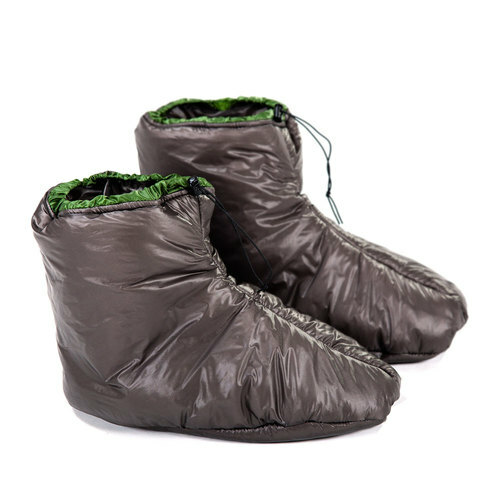 If that wasn’t enough, I was able to outfit Loonie with a pair of Tim’s Climashield “Sidekick” sleeping booties and “Hoodlum” hood, each weighing a mere 1.5 oz. Those AND the quilt wound up costing not much more than what I was going to spend on just the materials to make the 950 fp quilt. Loonie should sleep nice and toasty now. All of the above still comes out weighing FAR less than the combined weight of two typical 20 deg bags plus we’ll get to snuggle up tight. Awesome! Since we’re targeting not one but possibly TWO major trips to Yosemite next year and considering we were seriously lacking in adequate sleeping gear for Loonie, these were big time acquisitions. There’s a 6-8 week delivery time as these are made to order but we should have them in time for the trip in the Smokies in April. Maybe even for a long weekend trip on the River to River Trail in March. Stay tuned for photos/first impressions. Ours will have an Aegean Blue shell – looks sweet! We’re headin’ out in a bit to meet up with the Deep Woods Duo at REI to check out the Osprey packs. Hopefully that will go well. If so, we’ll just have to get Loonie squared away with a pack and we’ll probably make that ourselves. I already have all of the hardware and notions. Just need to figure out the design and buy the fabric. Update: The Osprey is on it’s way! 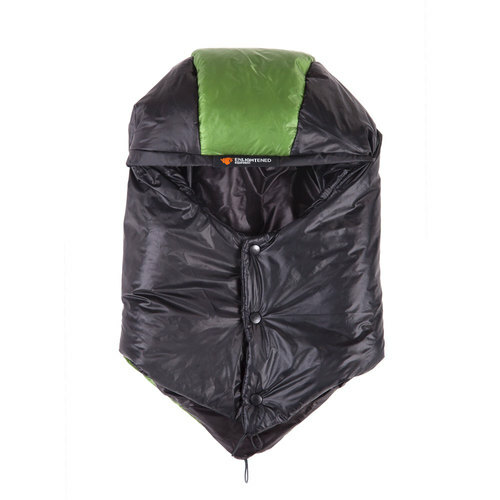 Got the “REI EX” model which came with a rain cover and 3L dry sack…for the same price…but it was only available online. Should have it in a few days.